Every notice that English has too many words? Take greenhouse for example – A greenhouse is just a fancy term for a box, made of glass or plastic, that allows sunlight through, and keeps heat in and wind out. Once you boil it down like that, you’ll realize that you’ve got all kinds of thing kicking around that can be rigged into greenhouses. And it’s high time that we discuss bucket greenhouses. 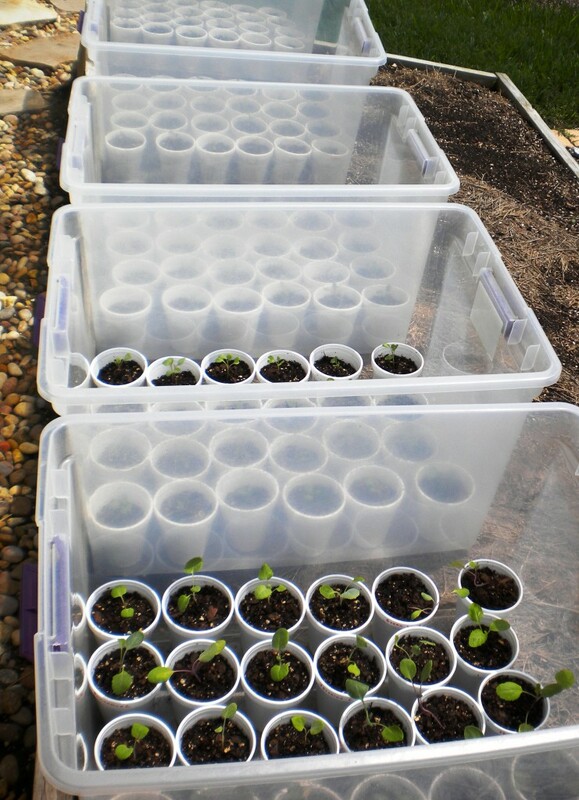 These bucket greenhouses are sheltering seedlings through those delicate first few weeks of plant growth. 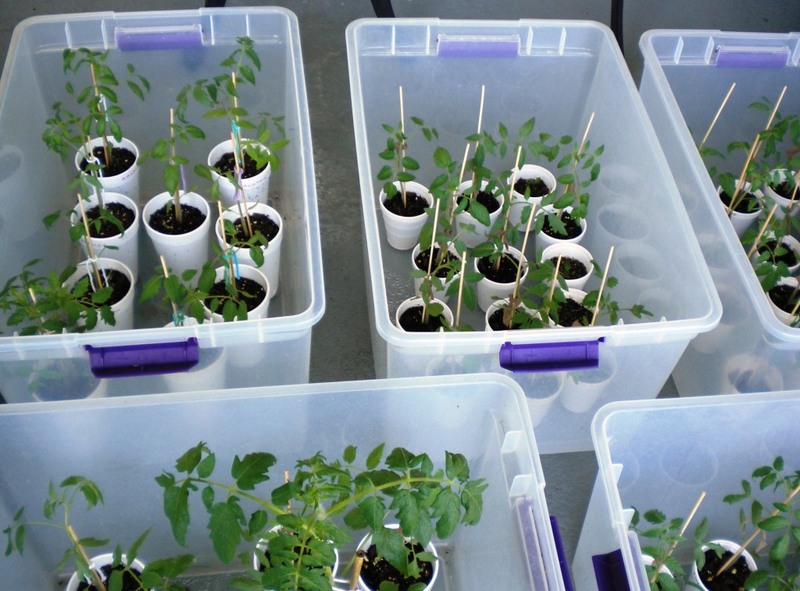 These plastic storage buckets aren’t just good for keeping plants warm and out of the wind – the plants are made portable because they can be carried around. So they can follow the sun – with your help of course. This bucket brigade of mini greenhouses was photographed on a hot day, which is why you see them uncovered. 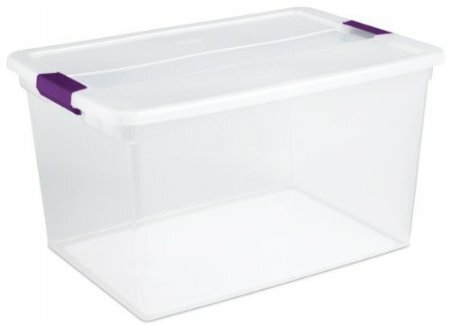 And if you need to raise the temperature in these mini greenhouses, just stick on your secure fitting lid, which actually comes included with these storage totes when you first buy them. Will it Work With 5 Gallon Buckets? Now I’ve never come across a translucent 5 gallon bucket in my travels. To be a greenhouse, it’s got to let plenty of light through. If you’ve found 5 gallon buckets that would work as greenhouses, please show me! It could be that strong translucent plastic is rare, clear plastic seems to be more delicate and brittle, which is why you’ll more often find it used for light duty indoor storage. Interested in some even crazier greenhouse ideas? 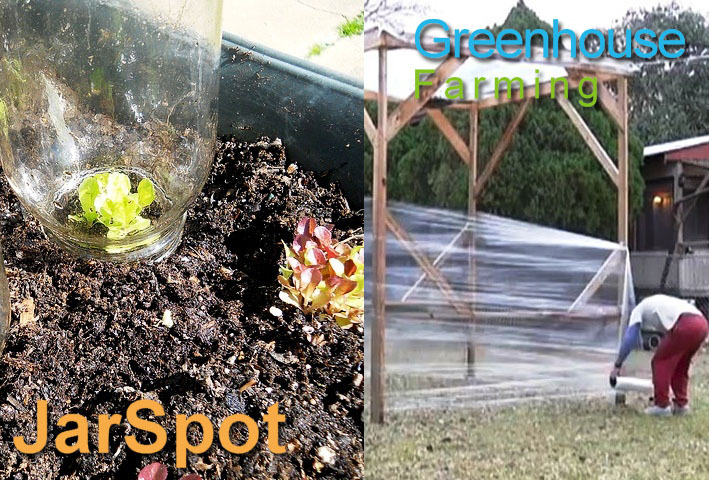 I’ve covered using mason jars for a greenhouse before on another site, and have several greenhouse ideas on greenhousefarming.net. Yes, holes in the bottom will drain excess water and will serve to wick up any water from the bottom of the main container as the soil in the seedling containers dries up over time. 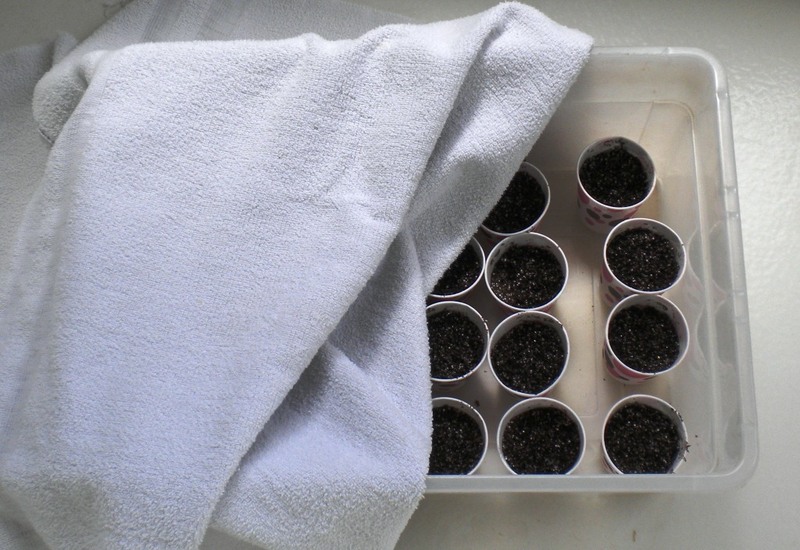 That’s how I start all my seedlings in small containers with holes in the bottom along the outer edges this allows for water to wick back up from the tray into the seedling containers set in the bottom. I tried this last year with awesome success and I’ve got my spring seeds in them now. One other aspect though that adds an even greater dimension is to pour an inch or so of water in the bottom where they then become water wicking greenhouses. You can easily add any water soluble fertilisers into the water too. Just keep an eye on the water levels that they don’t drown plants. Last year I had pumpkin seeds germinate and sprout within days! 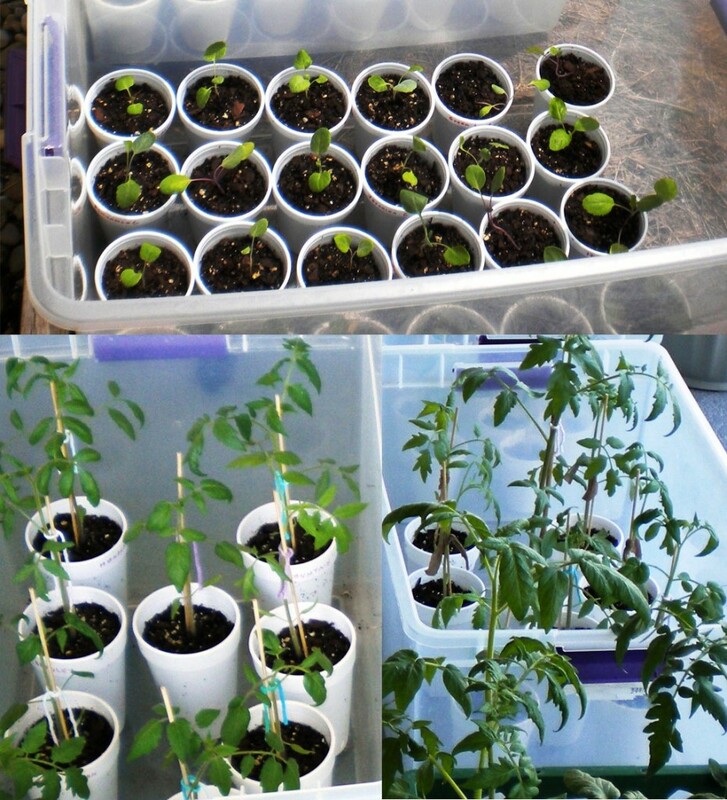 I use clear “leaf bags” as mini green houses to get plants in containers started. Just put the containers in the bottom of the bag in a sunny spot, fill the bag with as much dry air as you can (open it up wide and shake it out) and then close it tight, capturing the air inside and close tightly with a jumbo twist tie. We use distilled water at home in the gallon jugs. plants. Each plant has it’s own greenhouse even if the weather is freezing. They work great and are FREE !!!! I like to use Red (supposedly, plants like the red better) Solo Cups to start plants; I use a small metal rod, heat it on the stove top, & burn a hole (stack them, do several at once) through the bottoms. To start plants whose roots don’t like to be disturbed, I start them in little 5oz. Dixie Kitchen Cups; the bottoms dissolve after being in the ground a week, & I get an early start on summer! I am a somewhat of a beginner gardener. I generally get mostly plants when I go to do my garden. However this yr I plan to start somethings as seeds. So the tote idea I find awesome! As long as you keep it covered in cooler weather these totes do stay outside correct?